So often when we encourage kids to write, we focus on visual prompts. 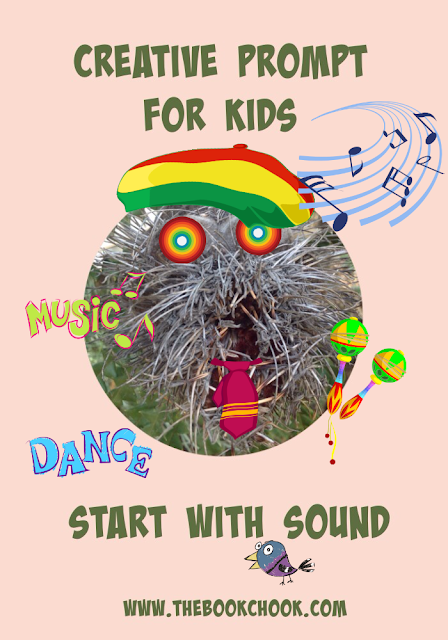 Today I hope to encourage children to use sound as a prompt for some form of creative activity. You can find my other creative prompts for kids series in the List below. * Go outside someplace safe and close your eyes. Listen to the sounds and let your mind drift. When you’re ready, open your eyes and use some or all of the sounds to suggest what you would like to create. You might choose to design a poster, paint a landscape, take a photograph of something you heard and describe it, write a poem, build a collage from the natural things you see, or something else. * Set yourself and your friends this challenge: to create soundscapes that build a mental picture in others’ minds. For instance, you might decide to represent the sounds we hear on a stormy day. Perhaps you’ll do this by drumming on furniture for thunder, using soft body percussion for rain, using voices for the wind to build up and die down, using instruments, adding a background piece of music, having one or two sentences for people calling out about the storm etc. You could also invent a fantasy soundscape such as try to create a haunted house for others to listen to. Practise until you’re happy with your soundscape. Make sure kids in the audience close their eyes, then perform it for them. Later you could choose one of the soundscapes you listened to when it was your turn to be in the audience. Create something based on that soundscape and the pictures it made in your head. * Visit Tabletop Audio, and listen to some of the soundscapes there. Relax and imagine a scene in your head, a narrative or something more abstract. When you’re ready, work out how you want to respond to one of these soundscapes, gather your materials, and get started. * At Tabletop Audio, you can also create a soundscape from sounds on a pad. Combine elements like wind, water dripping, footsteps, rats, and other eerie noises to build an impression of a dungeon. * Open an exciting book and find some dialogue inside. Look for one short sentence you can give to a friend to prompt a story from them. Practise that line, then record yourself saying it. (Skip recording if that part’s too hard.) Have your friend listen to the line, then build up a story containing that line/starting with that line/finishing with that line. * Find some unusual music. Lie down and listen to it, allowing a picture or story to build up in your head. When the music finishes, find a partner to share stories with, before you go on to create something based on that story. * Brainstorm a list of as many sounds as you can. Choose three of those sounds and weave them into a story. Create a soundscape based on those three, and record yourself after you’ve practised. * Make your own musical instruments from everyday objects or recycled junk. Experiment with all the different sounds you can make. Can you use those sounds in a storytelling session? * Create a puppet and give it a voice by thinking about its personality. Does your puppet sound loud and grumpy, or timid and jumpy? Have your puppet talk to someone else about a problem it’s having. Develop that talk into a multi panel comic strip. * Paint, draw or sculpt some sounds. What would “BANG!” look like? How could you draw “whistle” or “screech”, “crinkle” or “hush”? Use play-do or clay to create a visual representation of your chosen sounds. * Use an app like Toc and Roll to create your own musical composition. Use that music as part of a completely different creation, perhaps a play or an advertisement. * Use an app like 30 Hands to combine your voice and some images to create a story. * Roar some terrible roars then find something you can use that could possibly make such sounds. Take some photos of your roaring thing with an iPad, then use the free app, YakiT Kids to make a very short video about it. * Make a longer video of yourself bringing a creature to life via the iPad app, Chatterbox Kids. Let us find out about the creature from what it says about itself. I’ll be adding this post to my List of Creative Prompts for Kids, which you’ll find embedded below.